Six years into the housing recovery, prices are still climbing, largely thanks to an inventory shortage. Thought we’d never reach the heights of last decade’s frothy housing boom? Think again. 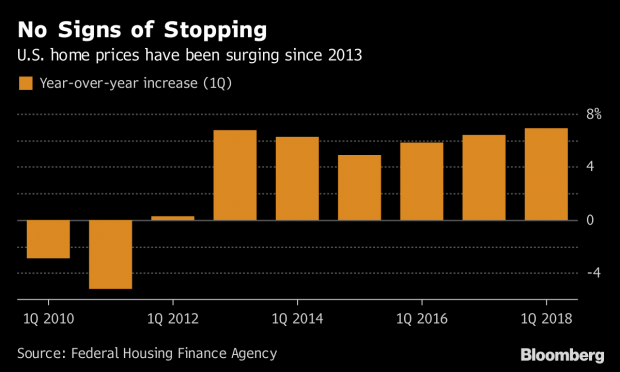 In the first few months of 2018, U.S. home prices jumped more than in any first quarter since 2006. Single-family home prices rose 6.9% from the first quarter of 2017, according to data released Thursday by the Federal Housing Finance Agency. That’s the most for the start of a year since 2006 — when the gain was over 9.1% — and the highest for any quarter since 2013.